o Cable TV signal source IN. o Satellite TV signal source IN. o TV set with Audio/Video input. You want satellite TV AND Cable TV? You want to be able to record a TV show from cable while recording another TV show from satellite? By using a TV with only standard inputs, and 2 VCRs, this can be done. To view or record TV shows from both satellite and Cable TV. o Watch TV from satellite or cable TV. o Record one while watching another, either cable or satellite. o Record two shows at the same time, one from cable and one from satellite. The TV will need to be set to the proper input. For Cable TV, set TV to channel 3. For satellite TV, set TV to LINE (Video) Input. VCR 1 should be set on channel 3 to record and also to output on channel 3. VCR 2 should be set to LINE input to record. Cable Box should be set to output on channel 3. You can switch back and forth from cable to satellite on the TV by using the TV remote. 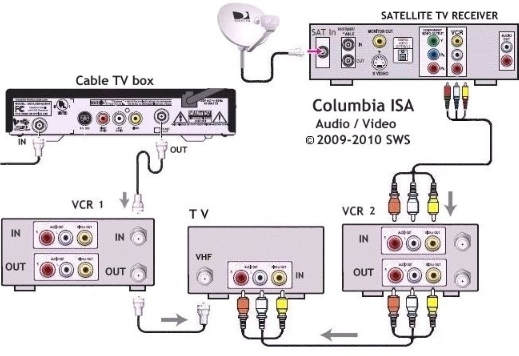 You can switch the cable hookups so that the cable box uses the RCA cable hookups and the satellite box uses the RF coax setup. The VCR with the RF coax cable hookup will pass-thru the signal even if powered off but the VCR with the RCA cable hookup will need to remain powered on in order to watch TV from that source.